New Suzuki SX4 special edition | What Car? A new special-edition trim is available on Suzukis SX4 crossover. The X-EC trim, which comes with the 1.6-litre petrol engine and manual transmission, adds sat-nav, Bluetooth and electric folding door mirrors. The seat fabric and alloys get a special design, too, while metallic paint comes as standard. It is available in one of three colours: Galactic Grey, Cosmic Black Pearl and Cool White Pearl. 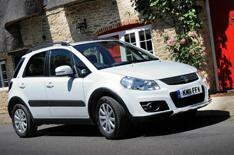 The Suzuki SX4 1.6 X-EC will go on sale later this month, with prices starting from 13,430.